The new year always brings about the start of new quilting Block of the Month projects and quilt-alongs. I’m working on a list of those that I’ve found which I’ll post later in the week. If you know of any or are hosting a free BOM/quilt-along, please send me an email and I’ll include it in my list. Last week, the final installment of Erin Russek’s Florabunda BOM was published. Erin will be removing the BOM files January 5th to make room for her My Tweets BOM for 2011. Check the Flora Buddies Flickr Group to see all the gorgeous fabrics participants’ have used. Isn’t this wonderful? I came across this just a couple of days ago…..I think anyone who loves applique will want this one. Erin’s blocks are beautiful! I found her about a month ago and have downloaded the blocks and hope to work on them this year. Love Erin’s blocks and thanks to both of you for the easy downloads. 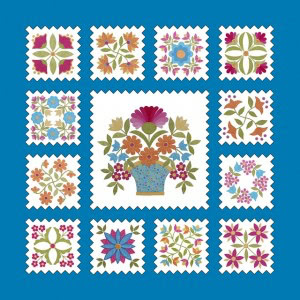 They are wonderful inspiration for the floral borders of my quilts. Thanks a lot !! I really want to do a BOM this year and you have given me some WONDERFUL jumping off points …now, if I can only pick ONE !!! !